INDICIUM Correspondence Management | INDICIUM Software, Inc.
INDICIUM Correspondence Management makes it easy to capture and control your incoming paper, email, and faxed correspondence. In a manual environment, it can be difficult to track who is handling each item, whether it has been completed or if it’s still in process. An even harder task is determining your organization’s communication history with the correspondent or finding historical records for other items pertaining to the same topic. Go beyond just tracking your inbound and outbound correspondence—make it work for you! INDICIUM Correspondence Management can help you to capture it all and automatically route it to the right people to respond. Paper shuffling ends at the Capture station, where incoming documents are scanned and queued up—along with electronically imported faxes AND email correspondence—for staff to review and process. 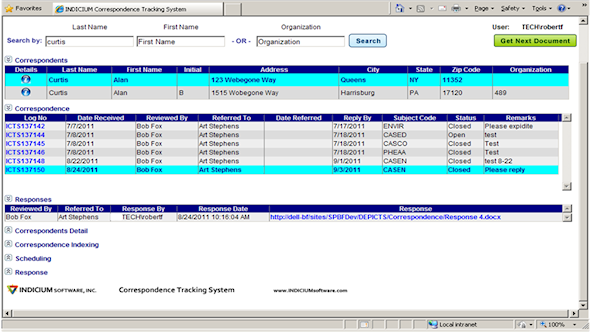 All items are assigned a log number and the electronic images/files are stored within the system. Electronic routing along predefined paths, or ad hoc rerouting, keeps the documents moving without bogging them down in transit. Outbound response documents are easily created using MS-Word templates, and can be routed to a review queue prior to sending. The responses are linked to the original incoming correspondence for quick and easy retrieval. Your staff can retrieve, view, and print a full history of all communications relating to a case or correspondent. Automated workflow and work queue management enable supervisory staff to monitor the process from end to end, adjusting workloads as necessary to avoid bottlenecks. Alerts and notifications warn of any delays in processing, aiding in compliance with time-related restrictions. Built-in security and auditing provide authorized access assurance and complete visibility of all process participants, showing who accessed what and when. Integrated with the robust INDICIUM DM and INDICIUM Flow software, INDICIUM Correspondence Management enables electronic collaboration across desks, departments, or organizations, with seamless inclusion of all correspondence documents in the repository. The expandable platform can easily grow to support other areas of your organization.